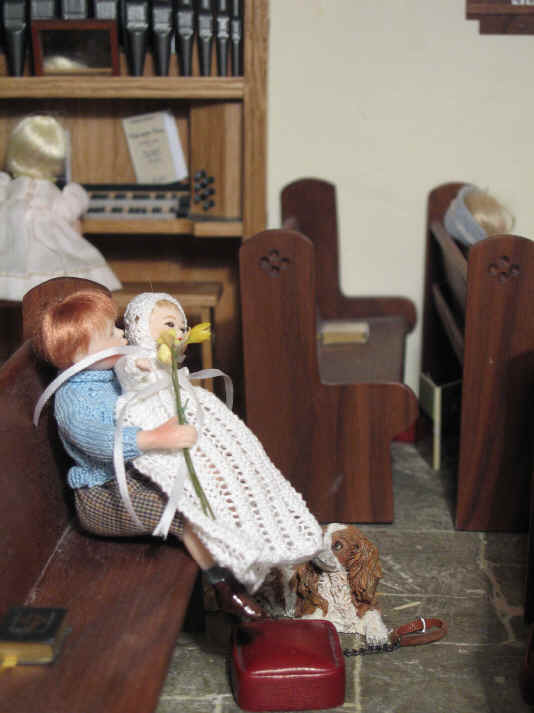 Mothering Sunday is always celebrated in St Hilary's with mountains of daffodils that the Sunday School children take home to their mothers. Ambrose is very proud of the flower box which he brought from his farm especially for St. Hilary's Church. 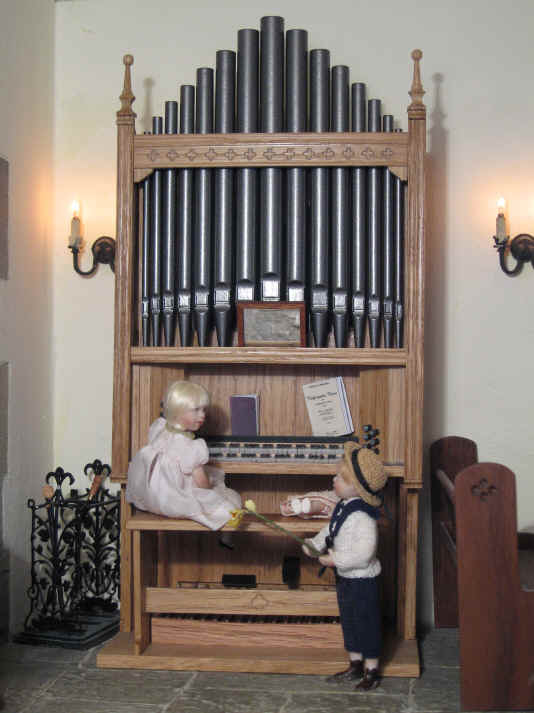 It has pride of place alongside the side of the church building. Ambrose always takes care to plant loads of Spring flowers in it so that they all are in full bloom for Mothering Sunday. Ambrose is VERY proud of the daffodils he has brought along this morning because he and his father grew them on their farm especially for this annual and special Mothering Sunday morning service. 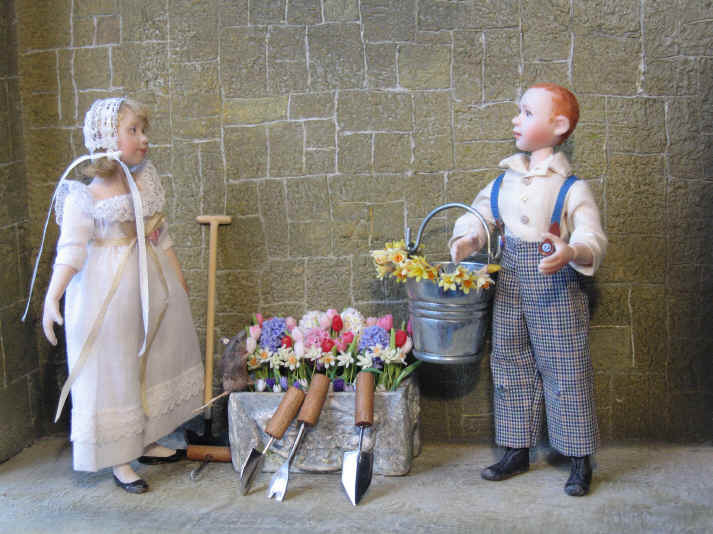 Can you see that Ambrose has also brought some gardening tools as he has asked the children if they could also arrive early to help him weed the flower box? Alice is so proud of Ambrose as she checks out the flowers in the bucket and the flower box. Someone else is also enjoying the flowers too..........it is none other than Sepp, Homer's pet rat! Oh dear...........what is happening here? Sepp is STILL having a good sniff of the flowers! Poor Ambrose! It appears that only Amelia has remembered to come along early and help him with the task of weeding the flower box. However as you all will have probably guessed, she brought a book along in case she got bored with the task of weeding......and decided to bring a kneeler from the church to sit on too! Tinker has also joined them and is also checking the flowers out too! Miss Esther has arrived at church. Look who she has brought along with her? It is her's and her husband, Stephen's, baby daughter, Rachel Ann. This is Rachel Ann's very first Mothering Sunday so it will be an EXTRA special day! Adele just adores all babies and begged Miss Esther to pick her up! Be careful Adele.....do NOT drop her! Tom has also brought some daffodils. Magnifi-Cat looks on as do Ernest and Esme, the pair of mallard ducks from the local village pond. They think Rachel Ann just looks SO cute! 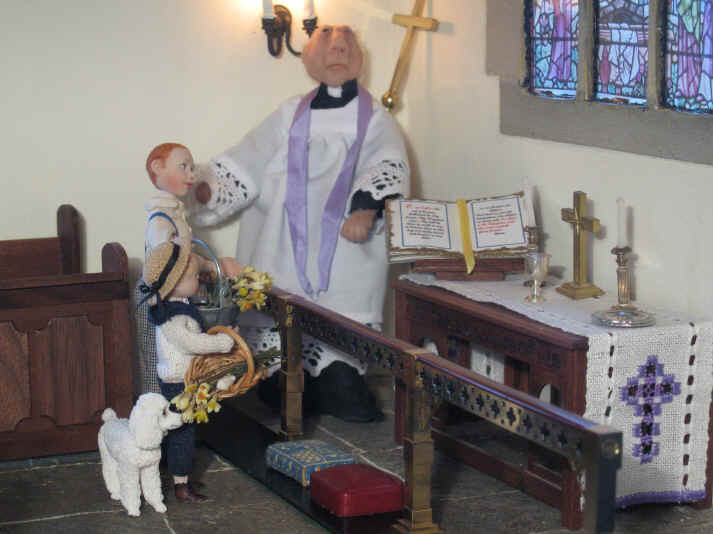 Tom and Ambrose bring their daffodils up to the vicar who is standing in the sanctuary. 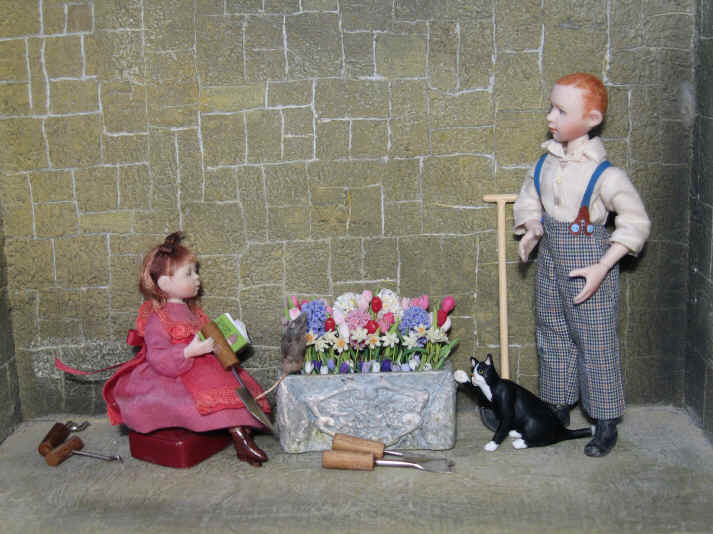 Do you notice something strange about Tom's basket of flowers? One of Nunc Dimittis' mousy friends has hitched a lift in the basket! Belle has decided to have a sniff of the daffodils too! All the daffodils are now on the altar after the vicar blessed them before they were given out to the children and ladies in the congregation and parish. 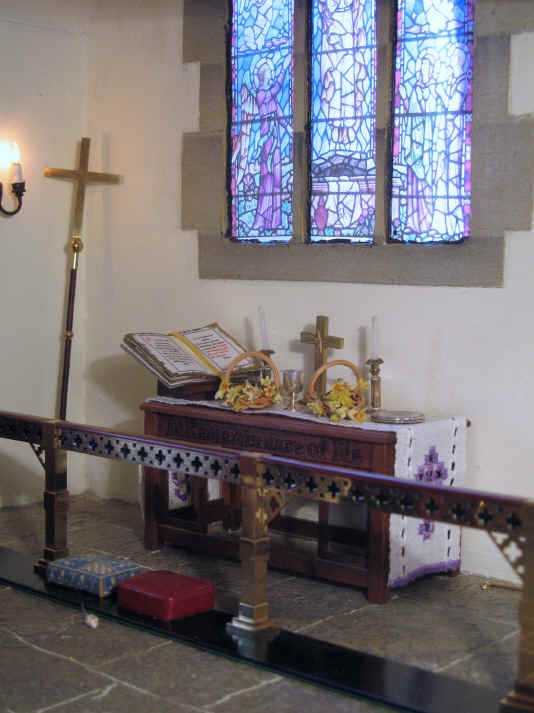 Can you see Nunc Dimittis' mousy friend scuttling away along the church floor?! Megan was thrilled to be asked to read the first lesson this Mothering Sunday morning. 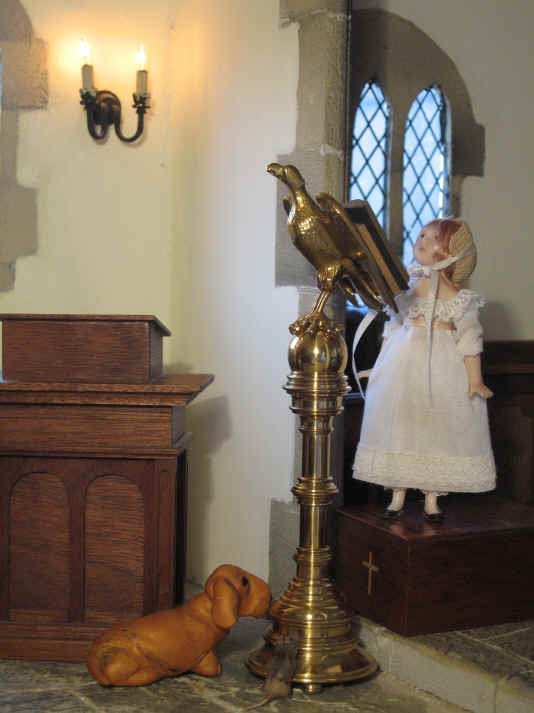 Although she would not be able to reach to read the lesson on the lectern the vicar has found a lovely wooden box for her to stand on so that she, like Alice after her, can read a lesson. She was so proud of herself as this was the very first time she had read in church. Bardsley, the bishop's dog and Sepp, the rat, have joined her. When she finished they both had to tell her how well she did. They love to encourage the children to do their best! The vicar is preaching the sermon. He has been given a bunch of flowers by Tom and he uses these to tell the children that, by giving these flowers to their mothers, they are letting them know how much the love and appreciate them. 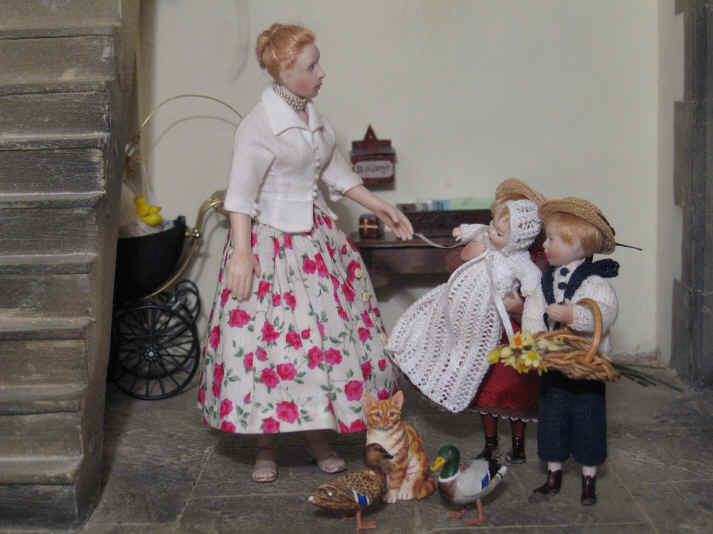 The vicar also explains that Mothering Sunday is traditionally the day that the church celebrates the fact that the church is known as "the mother church". Tom lets Phoebe have a bunch of daffodils. He wanted to tell her how well she had played too. 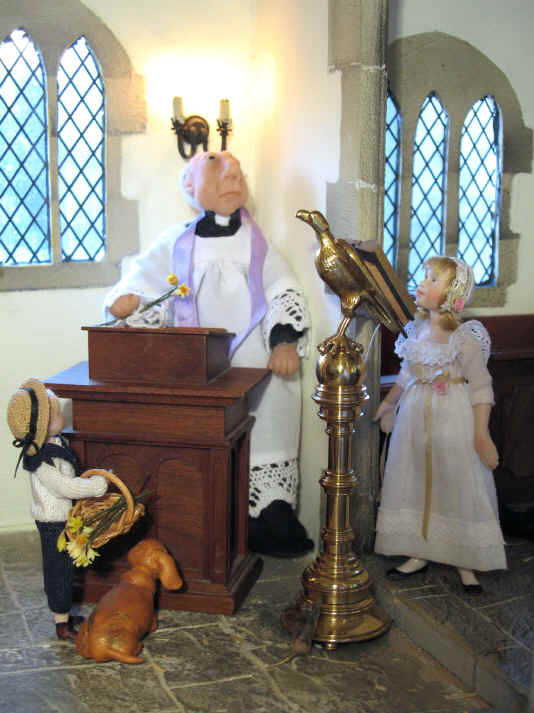 The vicar encourages the children and the church pets and wildlife to tell each other when they think they have done something well. The vicar knows how important it is for everyone in the church to love and encourage each other. So Tom made a special point of letting Phoebe know. Look who's been left holding the baby! Robert Alexander loves babies and couldn't resist asking Miss Esther if he could hold baby Rachel Ann for a while during the service........and she agreed to his request. She knows how careful Robert Alexander is when he holds babies. 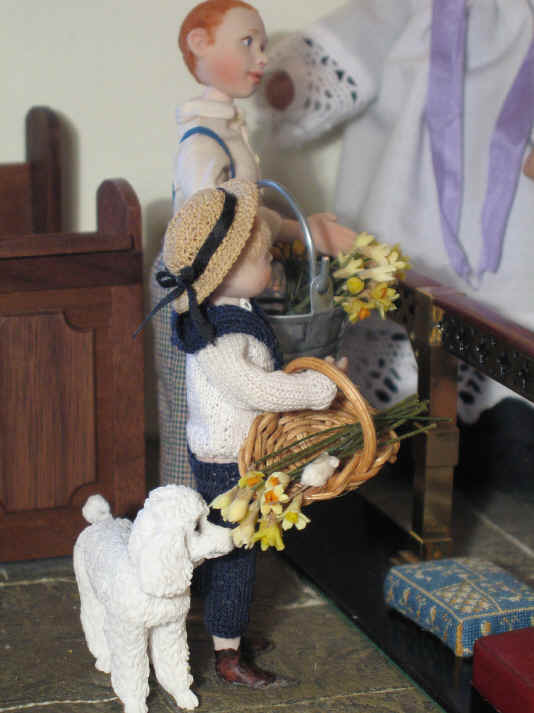 He has also fetched a bunch of daffodils for Rachel Ann and he will give them to to Miss Esther on baby Rachel Ann's behalf as she is too young to do it for herself yet! Well done young Robert Alexander for doing great work here keeping Rachel Ann quiet and good. Thanks to my sister, Catherine, for hand crafting all of the fimo flowers seen on this page. Thanks Catherine!